Not to be confused with boric acid or borinic acid. The general structure of a boronic acid, where R is a substituent. A boronic acid is a compound related to boric acid in which one of the three hydroxyl groups is replaced by an alkyl or aryl group. As a compound containing a carbon–boron bond, members of this class thus belong to the larger class of organoboranes. Boronic acids act as Lewis acids. Their unique feature is that they are capable of forming reversible covalent complexes with sugars, amino acids, hydroxamic acids, etc. (molecules with vicinal, (1,2) or occasionally (1,3) substituted Lewis base donors (alcohol, amine, carboxylate)). The pKa of a boronic acid is ~9, but they can form tetrahedral boronate complexes with pKa ~7. They are occasionally used in the area of molecular recognition to bind to saccharides for fluorescent detection or selective transport of saccharides across membranes. Boronic acids are used extensively in organic chemistry as chemical building blocks and intermediates predominantly in the Suzuki coupling. A key concept in its chemistry is transmetallation of its organic residue to a transition metal. The compound bortezomib with a boronic acid group is a drug used in chemotherapy. The boron atom in this molecule is a key substructure because through it certain proteasomes are blocked that would otherwise degrade proteins. Boronic acids are known to bind to active site serines and are part of inhibitors for porcine pancreatic lipase, subtilisin and the protease Kex2. 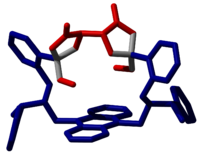 Furthermore, boronic acid derivatives constitute a class of inhibitors for human acyl-protein thioesterase 1 and 2, which are cancer drug targets within the Ras cycle. The boronic acid functional group is reputed to have low inherent toxicity. This is one of the reasons for the popularity of the Suzuki coupling in the development and synthesis of pharmaceutical agents. However, a significant fraction of commonly used boronic acids and their derivatives were recently found to gives a positive Ames test and act as chemical mutagens. The mechanism of mutagenicity is thought to involve the generation of organic radicals via oxidation of the boronic acid by atmospheric oxygen. In 1860, Edward Frankland was the first to report the preparation and isolation of a boronic acid. Ethylboronic acid was synthesized by a two-stage process. First, diethylzinc and triethyl borate reacted to produce triethylborane. This compound then oxidized in air to form ethylboronic acid. Several synthetic routes are now in common use, and many air-stable boronic acids are commercially available. Boronic acids typically have high melting points. They are prone to forming anhydrides by loss of water molecules, typically to give cyclic trimers. Another method is reaction of an arylsilane (RSiR3) with boron tribromide (BBr3) in a transmetallation to RBBr2 followed by acidic hydrolysis. A third method is by palladium catalysed reaction of aryl halides and triflates with diboronyl esters in a coupling reaction. An alternative to esters in this method is the use of diboronic acid or tetrahydroxydiboron ([B(OH2)]2). Boronic esters are esters formed between a boronic acid and an alcohol. The compounds can be obtained from borate esters by condensation with alcohols and diols. Phenylboronic acid can be selfcondensed to the cyclic trimer called triphenyl anhydride or triphenylboroxin. Compounds with 5-membered cyclic structures containing the C–O–B–O–C linkage are called dioxaborolanes and those with 6-membered rings dioxaborinanes. Boronic acids are used in organic chemistry in the Suzuki reaction. In this reaction the boron atom exchanges its aryl group with an alkoxy group from palladium. The reaction mechanism sequence is deprotonation of the amine, coordination of the amine to the copper(II), transmetallation (transferring the alkyl boron group to copper and the copper acetate group to boron), oxidation of Cu(II) to Cu(III) by oxygen and finally reductive elimination of Cu(III) to Cu(I) with formation of the product. Direct reductive elimination of Cu(II) to Cu(0) also takes place but is very slow. In catalytic systems oxygen also regenerates the Cu(II) catalyst. In the Liebeskind–Srogl coupling a thiol ester is coupled with a boronic acid to produce a ketone. The catalyst system in this reaction is tris(dibenzylideneacetone)dipalladium(0) / tricyclohexylphosphine. In this reaction dichloromethyllithium converts the boronic ester into a boronate. A Lewis acid then induces a rearrangement of the alkyl group with displacement of the chlorine group. 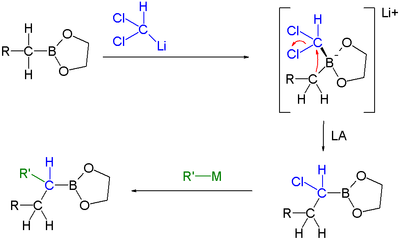 Finally an organometallic reagent such as a Grignard reagent displaces the second chlorine atom effectively leading to insertion of an RCH2 group into the C-B bond. Another reaction featuring a boronate alkyl migration is the Petasis reaction. Hydrolysis of boronic esters back to the boronic acid and the alcohol can be accomplished in certain systems with thionyl chloride and pyridine. Aryl boronic acids or esters may be hydrolyzed to the corresponding phenols by reaction with hydroxylamine at room temperature. The covalent pair-wise interaction between boronic acids and hydroxy groups as found in alcohols and acids is rapid and reversible in aqueous solutions. The equilibrium established between boronic acids and the hydroxyl groups present on saccharides has been successfully employed to develop a range of sensors for saccharides. One of the key advantages with this dynamic covalent strategy lies in the ability of boronic acids to overcome the challenge of binding neutral species in aqueous media. If arranged correctly, the introduction of a tertiary amine within these supramolecular systems will permit binding to occur at physiological pH and allow signalling mechanisms such as photoinduced electron transfer mediated fluorescence emission to report the binding event. Potential applications for this research include blood glucose monitoring systems to help manage diabetes mellitus. As the sensors employ an optical response, monitoring could be achieved using minimally invasive methods, one such example is the investigation of a contact lens that contains a boronic acid based sensor molecule to detect glucose levels within ocular fluids. ^ Garner, C. W. (1980-06-10). "Boronic acid inhibitors of porcine pancreatic lipase". The Journal of Biological Chemistry. 255 (11): 5064–5068. ISSN 0021-9258. PMID 7372625. ^ Lindquist, R. N.; Terry, C. (January 1974). "Inhibition of subtilisin by boronic acids, potential analogs of tetrahedral reaction intermediates". Archives of Biochemistry and Biophysics. 160 (1): 135–144. doi:10.1016/s0003-9861(74)80018-4. ISSN 0003-9861. PMID 4364061. ^ Holyoak, Todd; Wilson, Mark A.; Fenn, Timothy D.; Kettner, Charles A.; Petsko, Gregory A.; Fuller, Robert S.; Ringe, Dagmar (2003-06-10). "2.4 A resolution crystal structure of the prototypical hormone-processing protease Kex2 in complex with an Ala-Lys-Arg boronic acid inhibitor". Biochemistry. 42 (22): 6709–6718. doi:10.1021/bi034434t. ISSN 0006-2960. PMID 12779325. ^ Zimmermann, Tobias J.; Bürger, Marco; Tashiro, Etsu; Kondoh, Yasumitsu; Martinez, Nancy E.; Görmer, Kristina; Rosin-Steiner, Sigrid; Shimizu, Takeshi; Ozaki, Shoichiro (2013-01-02). "Boron-based inhibitors of acyl protein thioesterases 1 and 2". ChemBioChem: A European Journal of Chemical Biology. 14 (1): 115–122. doi:10.1002/cbic.201200571. ISSN 1439-7633. PMID 23239555. ^ Hansen, Marvin M.; Jolly, Robert A.; Linder, Ryan J. (2015-07-29). "Boronic Acids and Derivatives—Probing the Structure–Activity Relationships for Mutagenicity". Organic Process Research & Development. 19 (11): 1507–1516. doi:10.1021/acs.oprd.5b00150. ISSN 1083-6160. ^ Frankland, E.; Duppa, B. F. (1860). "Vorläufige Notiz über Boräthyl". Justus Liebigs Ann. Chem. 115 (3): 319. doi:10.1002/jlac.18601150324. ^ Frankland, E.; Duppa, B. (1860). "On Boric Ethide". Proceedings of the Royal Society. 10: 568–570. doi:10.1098/rspl.1859.0112. ^ Frankland, E. (1862). "On a new series of organic compounds containing boron". J. Chem. Soc. 15: 363–381. doi:10.1039/JS8621500363. ^ Dennis G. Hall, ed. (2005). Boronic Acids. Wiley. ISBN 978-3-527-30991-7. ^ Pilarski, Lukasz T.; Szabó, Kálmán J. (2011). "Palladium-Catalyzed Direct Synthesis of Organoboronic Acids". Angewandte Chemie International Edition. 50 (36): 8230–8232. doi:10.1002/anie.201102384. PMID 21721088. ^ Molander, Gary A.; Trice, Sarah L. J.; Dreher, Spencer D. (2010). "Palladium-Catalyzed, Direct Boronic Acid Synthesis from Aryl Chlorides: A Simplified Route to Diverse Boronate Ester Derivatives". Journal of the American Chemical Society. 132 (50): 17701–17703. doi:10.1021/ja1089759. PMC 3075417. PMID 21105666. ^ Chan, Dominic M.T. (2003). "Copper promoted C–N and C–O bond cross-coupling with phenyl and pyridylboronates". Tetrahedron Letters. 44 (19): 3863–3865. doi:10.1016/S0040-4039(03)00739-1. ^ Lam, Patrick Y.S (2003). "Copper-promoted/catalyzed C–N and C–O bond cross-coupling with vinylboronic acid and its utilities". Tetrahedron Letters. 44 (26): 4927–4931. doi:10.1016/S0040-4039(03)01037-2. ^ Sieber, Joshua D. (2007). "Catalytic Conjugate Addition of Allyl Groups to Styryl-Activated Enones". Journal of the American Chemical Society. 129 (8): 2214–2215. CiteSeerX 10.1.1.624.3153. doi:10.1021/ja067878w. PMID 17266312. ^ Gabriela (2007). "Benzylic Substitution of Gramines with Boronic Acids and Rhodium or Iridium Catalysts †". Organic Letters. 9 (6): 961–964. doi:10.1021/ol063042m. PMID 17305348. ^ Matteson, Donald S. (1986). "99% Chirally selective synthesis via pinanediol boronic esters: insect pheromones, diols, and an amino alcohol". Journal of the American Chemical Society. 108 (4): 810–819. doi:10.1021/ja00264a039. ^ Peng, Feng (2007). "Simple, Stable, and Versatile Double-Allylation Reagents for the Stereoselective Preparation of Skeletally Diverse Compounds". Journal of the American Chemical Society. 129 (11): 3070–3071. doi:10.1021/ja068985t. PMID 17315879. ^ Matteson, Donald S. (2003). "New asymmetric syntheses with boronic esters and fluoroboranes" (PDF). Pure Appl. Chem. 75 (9): 1249–1253. doi:10.1351/pac200375091249. ^ Kianmehr, Ebrahim; Yahyaee, Maryam; Tabatabai, Katayoun (2007). "A mild conversion of arylboronic acids and their pinacolyl boronate esters into phenols using hydroxylamine". Tetrahedron Letters. 48 (15): 2713–2715. doi:10.1016/j.tetlet.2007.02.069. ^ Takagi, Jun (2002). "Iridium-catalyzed C–H coupling reaction of heteroaromatic compounds with bis(pinacolato)diboron: regioselective synthesis of heteroarylboronates". Tetrahedron Letters. 43 (32): 5649–5651. doi:10.1016/S0040-4039(02)01135-8. hdl:2115/56222. ^ Ishiyama, Tatsuo (2002). "Mild Iridium-Catalyzed Borylation of Arenes. High Turnover Numbers, Room Temperature Reactions, and Isolation of a Potential Intermediate". Journal of the American Chemical Society. 124 (3): 390–391. doi:10.1021/ja0173019. ^ Ishiyama, Tatsuo (2003). "Room temperature borylation of arenes and heteroarenes using stoichiometric amounts of pinacolborane catalyzed by iridium complexes in an inert solvent". Chemical Communications (23): 2924. doi:10.1039/b311103b. hdl:2115/56377. ^ Murphy, Jaclyn M. (2007). "Meta Halogenation of 1,3-Disubstituted Arenes via Iridium-Catalyzed Arene Borylation". Journal of the American Chemical Society. 129 (50): 15434–15435. doi:10.1021/ja076498n. PMID 18027947. ^ Zhao, Jianzhang; Davidson, Matthew G.; Mahon, Mary F.; Kociok-Köhn, Gabriele; James, Tony D. (2004). "An Enantioselective Fluorescent Sensor for Sugar Acids". J. Am. Chem. Soc. 126 (49): 16179–16186. doi:10.1021/ja046289s. PMID 15584754. ^ James, Tony D.; Phillips, Marcus D.; Shinkai, Seiji (2006). Boronic Acids in Saccharide Recognition. doi:10.1039/9781847557612. ISBN 978-0-85404-537-2. ^ Rowan, Stuart J.; Cantrill, Stuart J.; Cousins, Graham R. L.; Sanders, Jeremy K. M.; Stoddart, J. Fraser (2002). "Dynamic Covalent Chemistry". Angewandte Chemie International Edition. 41 (6): 898–952. doi:10.1002/1521-3773(20020315)41:6<898::AID-ANIE898>3.0.CO;2-E. PMID 12491278.